When I saw Him, I fell at His feet as dead. It may be that, like the apostle John, you know Jesus Christ intimately. Yet when He suddenly appears to you with totally unfamiliar characteristics, the only thing you can do is fall “at His feet as dead.” There are times when God t may be that, like the apostle John, you know Jesus Christ intimately. 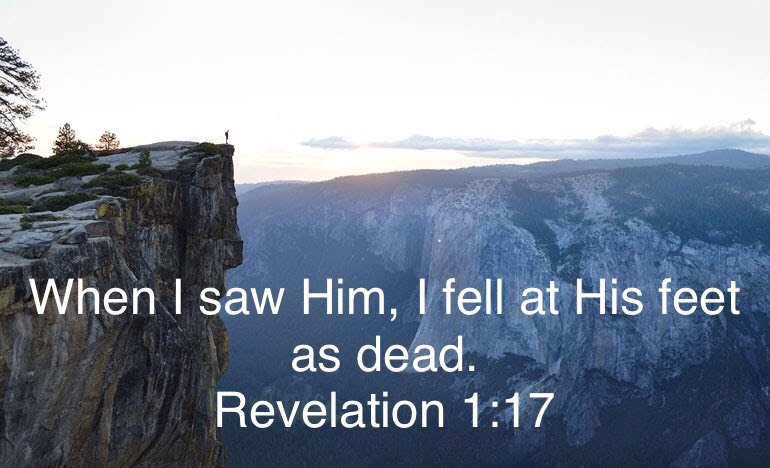 Yet when He suddenly appears to you with totally unfamiliar characteristics, the only thing you can do is fall “at His feet as dead.” There are times when God cannot reveal Himself in any other way than in His majesty, and it is the awesomeness of the vision which brings you to the delight of despair. You experience this joy in hopelessness, realizing that if you are ever to be raised up it must be by the hand of God. Take a look at some of the things that cause despair. There is despair which has no delight, no limits whatsoever, and no hope of anything brighter. But the delight of despair comes when “I know that in me (that is, in my flesh) nothing good dwells…” (Romans 7:18). I delight in knowing that there is something in me which must fall prostrate before God when He reveals Himself to me, and also in knowing that if I am ever to be raised up it must be by the hand of God. God can do nothing for me until I recognize the limits of what is humanly possible, allowing Him to do the impossible reveal Himself in any other way than in His majesty, and it is the awesomeness of the vision which brings you to the delight of despair. You experience this joy in hopelessness, realizing that if you are ever to be raised up it must be by the hand of God.